Which Halloween Candy Corresponds with your Favourite Toronto Maple Leaf? Now, I know what you’re thinking: “An article combining my 3 favourite things – Halloween, candy, and hockey?! This can’t be real!” Well, I assure you this is real and it’s as awesome as you imagined… minus the fact that there are only 6 players to choose from and goaltenders are not included (look, the narrative from those children’s toy commercials – “batteries not included” – actually came in handy!). Anyways, enjoy! Cleverness of Name: fairly self-explanatory. Originality of Product: how unique is the candy/player in comparison to others? Value: how much bang do you get for your buck? The Aftermath: how do you feel after eating the candy/watching the player? Style Points: How aesthetically appealing is the packaging of the candy? How fashionable is the player in terms of his equipment preferences? How impressive are his goal celebrations? * A last name as a first and a first name as a last? Two first names? Two last names? The confusion is just too much. * So much branding potential washed down the drain. With the “taste the rainbow” theme, why not go with Rainbow Bites? Or better yet, why not take advantage of the opportunity to use a snappy alliteration (one should always take advantage of the opportunity to use a snappy alliteration) and call them Rainbow Remnants? Educational and fun! Morgan Rielly is an extremely gifted hockey player. His skating ability is unparalleled and he has superb vision and hockey IQ to boot. It’s rare for a defenceman to be competent defensively and to also possess the ability to generate scoring chances at will. Skittles were one of the first non-chocolate bite-sized candies created. The concept of the candy in itself was very unique at the time (fruit flavours, hard exterior, soft interior). For a third-year player who’s now logging over 20 minutes of ice time per game and is by far the most versatile defenceman on the team, this price is a bargain for the Leafs. Skittles cost roughly $2.00 for a small pack and unlike the makers of Jelly Belly, the good people who invented Skittles don’t stiff you with several godawful flavours. Whenever Rielly is on the ice, there’s potential for something special to happen. Simply watching the kid skate can put you in a trance. Skittles are the perfect combination of sweetness, crunchiness, and chewiness. They’re like a warm hug for your mouth. * Let’s be honest, Rielly’s back/side jersey tuck pulls at all of our heartstrings; a good jersey tuck is the key to the soul. * Incorporating a rainbow explosion on the wrapper is always a good call. * With a last name as prime for pun as Gardiner, Jake’s parents really blew it with his first and middle name (William). Collin Zee Gardiner would have obviously been the better choice. * Smokey?! Really? What does that even…? It’s like the CEO’s at Lay’s just threw a bunch of paper slips with random adjectives into a hat and by default, went with the first one they drew. Gardiner is a phenomenal skater. He can pivot on a dime and his ability to simply skate the puck out of trouble is exceptional. Countless other food products have been reproduced in bacon flavour, thus originality points are deducted from this product. However, the sole fact that Lay’s was the first to adapt the flavour to chips more than compensates for this minor hiccup. Being the second highest paid defenceman on the team, Gardiner should logically be the Leafs’ second best defenceman… but he hasn’t been. In 2014-15, he only managed to finish 4th amongst defencemen on the team in scoring and on top of that, registered the 8th worst plus/minus rating in the entire league (-23). For a player whose performance is as up and down as a toilet seat, the Maple Leafs are not receiving their money’s worth. Honestly though, paying roughly $4.00 for a family-sized bag half-packed with air has never been so great. Mmmmm, bacon. Some shifts Gardiner makes brilliant plays, while others he gives the puck away. When he makes a good play, you can’t help but be happy. Your burps are bacon flavoured for the next 24 hours – I mean if that’s not happiness then I don’t know what is. Floppy skate tongues? Not cool, Jake. Not cool. Choosing to make the exterior of the bag a barf-coloured brown? I mean, c’mon. * Phaneuf is a beauty last name. * Dion is a fitting first name; it suits him well. However, a first name that better played off of his last name would have been ideal. * Points docked for not including “so sour that you will bawl your eyes out and people will laugh at you” in the name. Also, the “warhead” word choice seems odd and slightly counterproductive if you ask me. As imperfect as he is, Dion Phaneuf would be a top-4 defenceman on nearly any NHL team. He’s a big body and tough guy who eats large minutes year after year. He’s averaged over 23 minutes of ice time per game over the course of his last 11 seasons in the league. He’s registered 30 or more points in every season in which he’s played more than 70 games. He can shoot, skate, and hit, and is difficult to play against. Needless to say, the guy is a beast. Now a days, it’s difficult to find players around the league who possess these traits. This fact is in part because the game is transitioning predominantly toward speed and skill, but is also because players who embody Phaneuf’s qualities are few and far between. 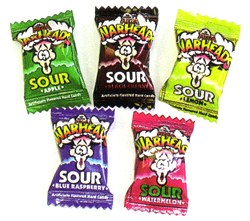 Invented in Taiwan in 1975 and imported to the United States in 1993, Warheads were one of the first sour candies on the market. By 1994, a $40 million brand was born. Phaneuf is the highest paid player on the Leafs by a landslide. Although he’s one of the faces of the franchise, this price seems awfully high. One would normally consider a price of $1.50 for a pack of numerous Warheads of 5 scrumptious flavours to be a good deal. However, when the extreme tartness results in the candy being in and out of your mouth in 10 seconds or less, the deal doesn’t seem so great after all. He just misses the net so. gosh. darn. much. Dion’s goal celebrations are as classy as they come. When he scores, he raises his arms briefly and hurries over to his teammates, ensuring that the focus shift from himself to his team. Fun-sized packaging + electrifying colours + legendary Warhead character = packaging perfection. * Last name sounds like “loophole” which is single-handedly enough to merit some serious points. * First name is considerably unique, as is its spelling. * Bonus points for having a full name (including middle names!) in which the pronunciation of every syllable is actually a real word (JAW-FREE DUG-LASS SHELL-DIN LOO-PULL) – his parents did him well. * The “Dubble Bubble” rhyme is golden. Two words: shootout specialist. Lupul earns significant originality points for his signature “blade fake” shootout move (don’t ask, just skip to 1:22 in the video below – it’s not something that can just be “named”). Although rather unconventional, the move seems to consistently leave goaltenders picking their jock straps up off the ice. Over the last number of years, the 6’1’’ left winger has distinguished himself as one of the most clutch players in the shootout. Since 2010 – including 2 attempts thus far this year – Lupul’s shootout success percentage is a solid 50% (11/22). In 2013, he nearly went a perfect 7 for 7, but fell 1 missed attempt short. 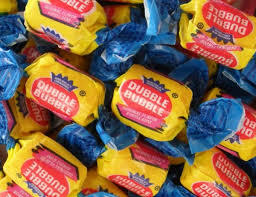 One of the earlier chewing gums produced, Dubble Bubble was the first of its kind to allow chewers to blow proper bubbles. The idea of including a colour comic strip in the packaging was also a sheer stroke of genius. Yes, Joffrey Lupul has become the standard measuring stick for injury frequency. The poor guy’s name has practically become synonymous with the word injured: separated shoulder, concussion, bruised foot, strained groin, knee surgery… take a breath… broken hand, lower body injury, lower body injury, and yep, you guessed it – lower body injury (honestly though, can that term possibly get any more annoying?!). For the amount of money he’s being paid and for the amount of games he misses every year, the Leafs are simply not receiving enough bang for their buck; they’re drastically overspending. Five cents for a piece of gum that’s worth keeping in your mouth for well, basically 5 seconds. 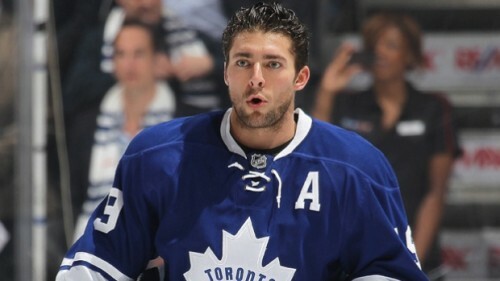 Lupul is an exciting player to watch; he brings energy, passion, and a touch of grit to every shift he plays. But again, just when he starts to warm up, his body starts to wear down. The gum is delicious for the first handful of chews and then you’re basically better off chewing a wad of Play-Doh. * Lupul often releases an emphatic scream when he scores and this enthusiasm is the sole reason that the word beautiful exists. * You know how sometimes you just can’t peel your eyes away from something? Side note: let’s keep it PG here boys. Well, that’s precisely the case with the Dubble Bubble packaging; for whatever reason, the design and colour scheme just work. * Komarov is currently the only Leo in the entire NHL. Points for uniqueness? You bet. * His last name rolls off the tongue nicely. * Tootsie is one of the catchiest words to ever exist in the English language. Its meaning on the other hand may raise some questions as per this choice. As much as we all love Leo, he’s not drastically unlike many other 3rd or 4th line player in the league (although he’s currently playing on the 1st line – telling, isn’t it?). His sound positional play and dedication to hitting anything and everything moving within 10 feet of him are the only two aspects of his game that could cause distinction. His compete level is also off the charts. A chocolate flavoured candy. Real original – not. 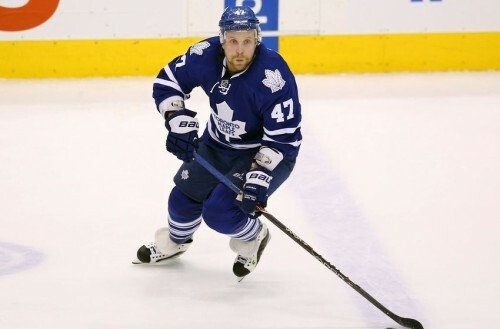 Any NHL team would be happy to have Leo Komarov in their lineup. He’s one of those guys that opposing players hate to compete against. Good price for a good player. A tub of 280, 3-inch Tootsie Rolls – because apparently they sell candies in tubs now – costs around $25.00. 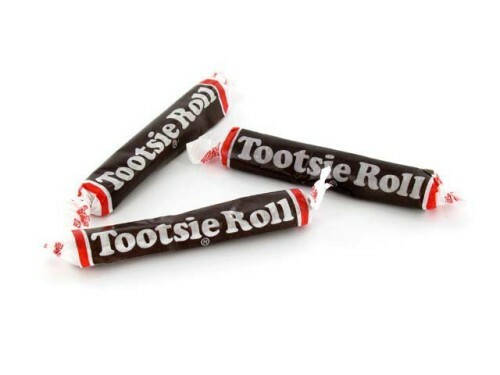 Thus, after doing the math, each individual Tootsie Roll is valued at around 9 cents. Safe to say that’s a pretty sweet deal (no pun intended). … and to get your dentist to remove that stupid chewy mess of a candy out of like, pretty much all of the grooves of your teeth… and then to fill your 5 new cavities… and then to re-adjust your jaw because you overexerted it chewing. Floppy skate tongues again?! Man, what is this? How many candies have wrappers that are predominantly brown? The wrapper creators could have even just added some depth to the brown by blending a few different tones (see Caramilk – they did brown the right way). * His last name has so many letters but points are in order because his parents were selfless enough to decide upon a first name as simple as James. * Self-explanatory names are the best kind of names. 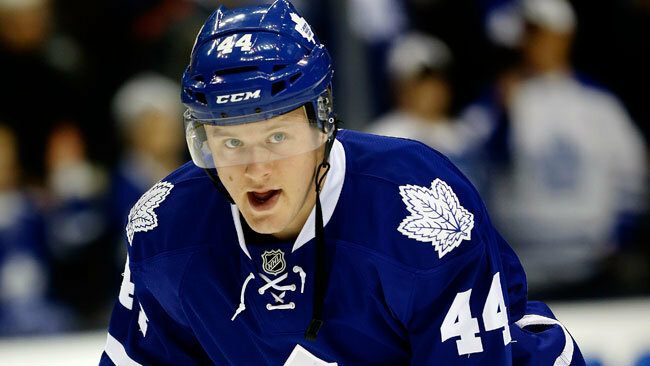 JVR has invented a brilliant side-of-the-net move that has become his go-to on the power play. Points are most certainly in order. Plus, Van Riemsdyk is the epitome of the ideal power forward: big, strong, fast, and skilled. Candy… on a string… made into a necklace… that you can wear… MIND-BLOWING AWESOMENESS. 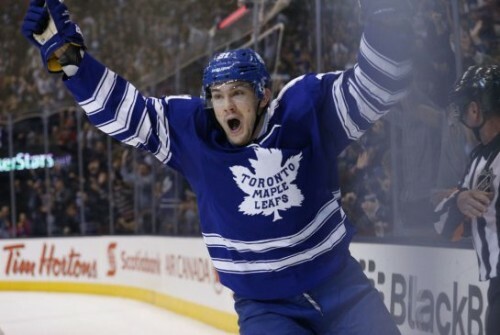 Since being acquired by the Leafs in 2012, JVR has been one of the team’s top 3 scorers each season. This dollar figure is quite reasonable for a player of his calibre. You can currently purchase a 24-piece Candy Necklace for just over approximately $4.00. A little pricey? Perhaps. But totally worth it. … and because you can have your jewellery and eat it too (darn, that didn’t sound quite as good as it did in my head). Also because you can be selfish without actually appearing selfish; you automatically don’t have to worry about sharing the candy because nobody wants it after it’s been in your mouth, and the only possible, convenient way in which you can share it is by biting it off … with your mouth. Van Riemsdyk’s two-handed downward fist pump celebration is deserving of points, however the fact that his neon green mouth guard is constantly sticking out of his mouth during play is slightly disturbing – not to mention a choking hazard. 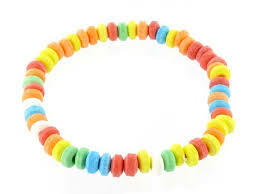 The inventors of the Candy Necklace clearly spent every last minuscule drop of their creativity on the food product itself as they decided that a boring old clear plastic wrapper was the way to go.